Download and Install the WAIK 3.0 on this machine. If using virtual machine you can mount the ISO to the virtual CD/DVD drive. To install the WAIK 3.1 supplementary update, run command prompt in elevated mode and change directory onto the mounted CD/DVD drive with the following command assuming E: drive is where the CD/DVD was mounted. There will be 1131 files that should be copied. Now you can launch the “Deployment Tools Command Prompt” as an administrator to begin the creation process. Note: The copype.cmd batch will create a folder structure under the named destination above “c:\winpe_x86” and “c:\winpe_amd64” with appropriate sub-folders. Note: Keep track of the “boot.wim” files, name them accordingly to not get the x86 and amd64 mixed up. For example WinPE3.1_Boot_x86.wim and WinPE3.1_boot_amd64.wim will be used as reference from this point forward. Adding drivers to WinPE boot images outside of SCCM’s native format is a painstaking process. However, for our needs we needed to add drivers for at least 8 different models. I decided to leverage SCCM by importing each model’s drivers and organizing them through driver packages. This would let me have future usage of the drivers that may be needed in future OS deployments on newer versions of WinPE. If you already have a driver structure configured you may skip this section and go straight into injecting drivers into the WinPE boot image. Launch the SCCM Console, within Software Library expand Operating Systems and right click under Drivers. 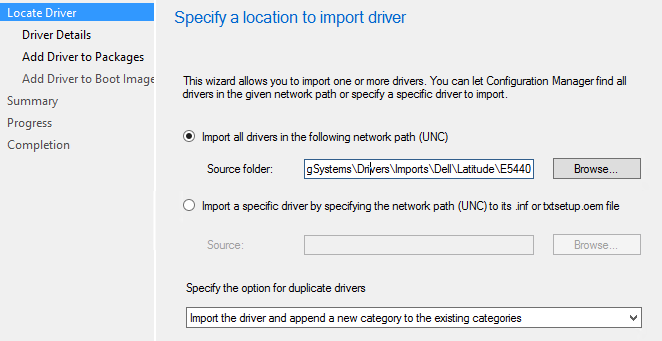 Import the downloaded drivers to SCCM leveraging the newly create import repository as the source folder for each Model #. Assign the newly imported drivers to a category matching the model # for easier management. 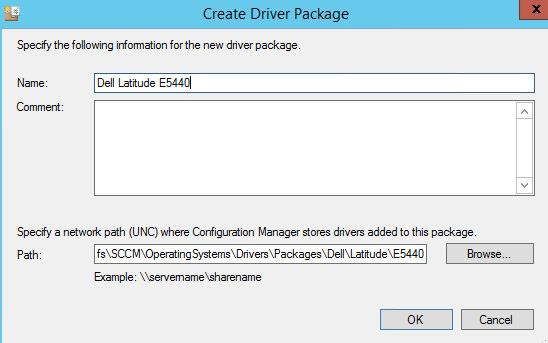 Create a driver package if it does not already exist and leverage the newly created driver packages repository, where SCCM will store the already processed drivers. Repeat this process for all the desired models that will need WinPE 3.1 drivers imported. Continue through and finish the wizard. Create a folder on the root of C:\ called WinPE. Copy the WinPE3.1_Boot_x86.wim file previously saved under C:\winpe_x86\ to the C:\WinPE\Images\ directory. Copy all of the processed drivers located under the driver packages directory’s top folder \\SERVERNAME\SHARENAME\OperatingSystems\Drivers\Packages\ to the C:\WinPE\Drivers\ directory. Now wait as this process can take a fair amount of time based on the number of drivers. The modified file should reside under the C:\WinPE\ directory and is now ready to be imported as a boot image in SCCM. Finally we can import the modified WinPE 3.1 boot image into SCCM so it can be used for any type of OS deployment on the appropriate machines. Copy the WinPE3.1_Boot_x86.wim files to the share location where SCCM can access them in whatever structured mechanism works for you. Launch the SCCM Console, within Software Library expand Operating Systems and right click under Boot Images. Specify the name, version and comments. Review the summary and hit next and close. Distribute the boot image to distribution servers as needed. Note: Custom wim files do not have a lot of the properties available to the default WinPE 5.0 boot image.